The cause of melanoma is attributed to gene mutations. Melanoma is also caused by exposure to sunlight for a longer period of time. Studies have shown that exposure to UV light can be a major cause of melanoma thus producing signs and symptoms of skin melanoma. The incidence of melanoma has been increased as a result of increased sunbathing. Some moles like Dysplastic nevi moles look abnormal and turn into melanoma. Ethnic origin and heredity are other causes of melanoma. There are following types of melanoma. 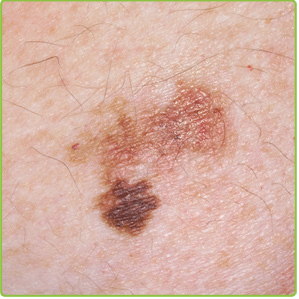 There is an ABCD Rule to differentiate between Melanoma and the Moles. Many people have moles on their body which are usually non cancerous and harmless causing no symptoms of melanoma. Other signs and melanoma symptoms include scaling, bleeding or oozing a mole, change in the appearance of a mole. Mole can become hard, itchy, lumpy, and tender or swollen. Melanoma may appear as a new mole on the body. In men, melanoma symptoms occur on the trunk. In women, melanoma is usually found on the arms and lower legs. Symptoms of melanoma appear in fair-skinned people. Dark skinned people have melanoma on palms of the hands and the soles of the feet. It is also observed that in most families there are individuals with unusual moles which can turn into melanoma. © Copyright Health Giants 2019 • All rights reserved.